It’s one of the biggest Events, with a capital letter, each year in genealogy. And it’s happening next week. Somebody called The Legal Genealogist is speaking about prison records… and there are many DNA sessions, computer workshops, focused presentations on using specific new technologies in research and lots and lots of opportunities to learn how to use technology to work smarter and faster. Some 15 sessions will be streamed live around the world, and you can see the list and the schedule here at FamilySearch. 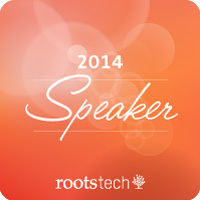 There’s a lot more information available at the RootsTech website. So… will we see you in Salt Lake City… or will you see us from around the world? You will see me in SLC. I can’t wait! Looking forward to it, Michelle!